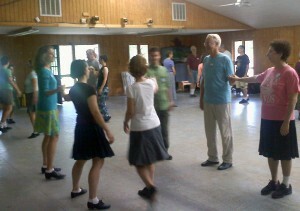 Brad Foster is program director this year for English Dance Week at Pinewoods. I dropped in to say hello and spent some time in his Joy of Dance class. The picture here is of Brad talking to us about the importance of good posture and finding joy in the dance! There was a very important, joyous gathering on Sunday night—Bravo Brad!, a celebration to honor Brad’s 28 years as Executive and Artistic Director of CDSS. It was a wonderful evening, filled with stories of Brad’s start in California (complete with stories of his short-lived football career in high school), and Brad’s attempt to meet Pat Shaw at Pinewoods (but CDSS lost his camp application). Music, dancing and revelry was provided by many dear friends, past and current board members, and colleagues, including Tom Siess, Gene Murrow, David Millstone, Laurie Andres, Ellen Judson, Tom Kruskal, Karen Axelrod, Sue Salmons, Jacqueline Schwab, Peter and Mary Alice Amidon, and others. 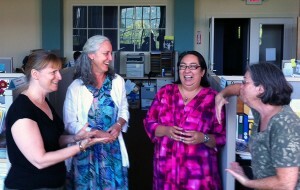 Our heartfelt thanks to the “Bravo Brad” planning committee: Jackie Algon, Sharon Green, Linda Lieberman and Steve Howe. Very, very special thanks to Judy Savage, Pinewoods Camp manager; her phenomenal crew for their help; and to the kitchen crew who gave us a Rapper Interlude, a HUGE thank you! The festivities for the evening went on way past my bedtime (I left the shindig just after midnight), but I hear there were a few after-party events. (Smile.) Also pictured here is part of the Bravo Brad program of Brad pictures. (Note how crumped the program is because it was smooshed at the bottom of my dance bag, under my water bottle.) We’ll be blogging more on the party, with photos and videos too. …and a fitting end to a summer’s worth of travel to each CDSS camp week in Massachusetts (Pinewoods), New Hampshire (Ogontz) and West Virginia (Timber Ridge). Thank you to Steve Howe, Robin Rogers-Browne and Kappy Laning for making CDSS camps possible! Thank you to all our program directors, instructors, crew, campers, and donors to camp scholarship and special programs! Thanks to the CDSS office staff and Governing Board! Thanks to everyone who makes the joy of dance, music and song at CDSS possible! It has been a wonderful summer for me to get to know all of you. May your final days of summer be fun-filled. I leave you with one last shot of the dock at Pinewoods as I tackle my in-box on my desk in the office and catch up with my email in-box too. (If I owe you an email, feel free to send a reminder to me at rima@cdss.org.) My daughter starts first grade on Thursday, so it is back to an early bedtime at our house. 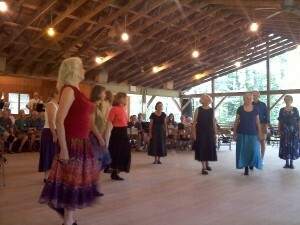 The end of summer does mean the start of the fall season for many local dances, so there is much to look forward too! P.S. Do send along pictures and videos you’ve taken at camps or your other summer dancing or musical adventures to share with us. This entry was posted in Features & Fun on August 29, 2012 by Lynn Nichols. Hello from Easthampton, MA. I’m back in the office for a few days before I go back to visit Pinewoods for our last camp week this season, English Dance, starting this weekend! 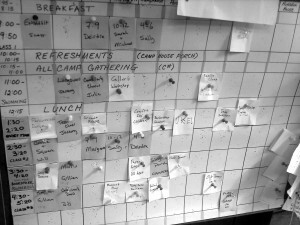 First night's planning---in addition to the basic schedule led by the talented staff, any camper may teach a class or workshop at the week. I had the pleasure of witnessing what happens at camp during change-over between Early Music Week and Campers’ Week—the hours between 10:01 a.m. to 1:59 p.m. where Pinewoods staff and CDSS staff say goodbye to the previous week’s campers, clean up cabins and all the facilities, have staff meetings, and get ready for greeters to show up at 2 p.m. and new campers to arrive at 3 p.m. It is astounding to consider that in just four hours the entire camp is cleaned and made pristine for the new campers. I also joined the staff for lunch and I got to eat yummy leftovers of one of my favorite meals from Pinewoods—Traditional Catalan Seafood Stew (Zarzuela de Mariscos), a savory stew with mussels, shrimp and fish in a slightly spicy tomato-based broth, and yummy chocolate mousse! And while light rain fell upon Pinewoods on Saturday, that did not dampen the spirits of the families for the start of Campers’ Week. 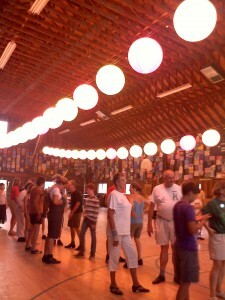 It was fun to see kids of all ages return to camp. 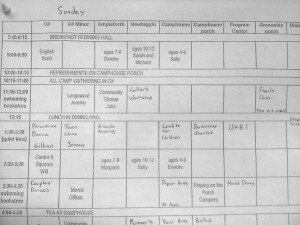 I had heard of the magic and miracle of the planning that goes on the first night at the week to schedule the week’s activities (check out pictures of the charts and schedule)—classes from knitting and macramé, to woodwork and ukulele, calling for beginner dances and much, much more! This entry was posted in Features & Fun on August 22, 2012 by Lynn Nichols. 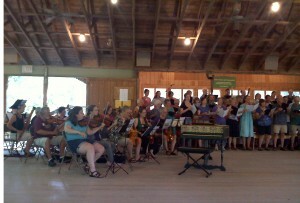 Hello from Early Music Week at Pinewoods! I got here today in time for lunch, and the lovely student concerts. The afternoon started with a procession of musicians from C# Minor to C#. 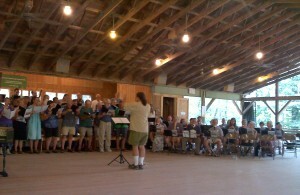 This year, most everyone at camp participated in the All-Camp Collegium as a singer, musician or dancer. The pictures below are of the arrangement called “Three Prayers for Peace.” While the dancers did not participate in this, I have included a picture of them dancing in another student concert presentation. Many of the selections this year focused on early music of the Iberian Peninsula. It was a delight to hear the culminations of the week’s hard work. Kudos to everyone! This entry was posted in Features & Fun on August 17, 2012 by Lynn Nichols. We’re excited to share with you that, because of past donors’ generous support of our Scholarships & Special Programs, Outreach Manager Linda Henry & Director of Programs Steve Howe have been able to award nearly $50,000 in work exchange and named scholarships this year, enabling some 250 recipients to come to camp this summer! Want to change someone’s life—like, now? Supporting CDSS’s Scholarships & Special Projects program is one of the simplest and most rewarding ways to do this. As we approach our Centennial in 2015, we’re committed to sustaining our ever-growing scholarship program; our outreach grants to groups and individuals for musicians, callers, and organizers workshops; regional leadership conferences; mentorships, publications, online resources, youth and intergenerational development; and other special projects that enrich and support the North American traditional dance, music, and song community. In order to sustain this work, we need everyone’s support! The generosity of many, many campers has sustained CDSS’s Scholarships & Special Projects program over the past 25 years and more. By the end of the summer, generous campers at Ogontz, Timber Ridge, and each of our seven weeks at Pinewoods will have done their bit to help raise $52,000 for future Scholarships & Special Programs. Go ahead: change a life! Not coming to camp? You can still experience the satisfaction of supporting these excellent programs by making a gift to Scholarships & Special Projects! Check out our progress towards our goal, and join the Beyond Camp community of supporters. Our day began with a metro ride into DC with our hostess, Stephanie Smith, an archivist at the Smithsonian Center for Folklife and Cultural Heritage. 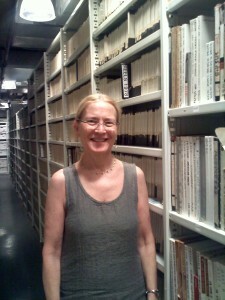 Stephanie gave us a tour of the Center for Folklife offices, including a peek into the archives themselves! In the midst of a very busy day at the Center, Curators James Deutch and Sojin Kim generously met with Rima, Stephanie, and me to brainstorm possibilities for collaborations between CDSS and the Center at the Smithsonian Folklife Festival in 2015, CDSS’s centennial year. We were also privileged to view the latest cut of the eagerly-anticipated English country dance documentary—a wonderful collaboration between Stephanie, NYU historian Danny Walkowitz, and award-winning videographer Charlie Weber of the Center for Folklife. Later, we met up for dinner with longtime CDSS friend Charlie Pilzer, on the patio of the Irish Inn at Glen Echo Park. We had a lively conversation in which Charlie shared his thoughts about celebrating the Centennial in DC and across the continent. As always, his infectious enthusiasm and seemingly boundless well of ideas invigorated and inspired us! We proceeded in high spirits to the Friday night contra dance in the Spanish Ballroom at Glen Echo Park, arriving in time to see the end of the Folklore Society of Greater Washington’s excellent 45-minute beginner lesson. 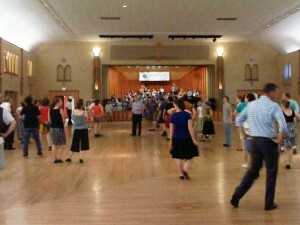 In the center of the photo you can see FSGW leader Greg Frock taking great care to ensure that some 50 newer dancers have the basic skills and social expectations to be successful and well integrated as the hall—one of the largest you’ll ever see!—soon fills up with 200-300 regular contra dancers. It also happened to be Open Band night, with than 40 musicians from the greater DC area playing on stage, for a wonderful evening of contras and squares led by caller Dave Colestock of Harrisburg, PA. A full day indeed! 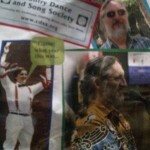 This entry was posted in Features & Fun, Updates from the Office and tagged cdss, contra dance, country dance and song society, english country dance, Rima Dael on August 15, 2012 by Lynn Nichols. The Olympic Games provided some opportunities to showcase some great folk dance and music. 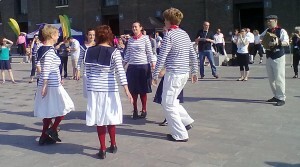 Folk dance groups performed at Olympic cultural events throughout England, and leading English folk musicians Eliza Carthy and Kathryn Tickell were both involved in the major BP River of Music project that comprised five music stages across London, each representing and featuring the music of one of the five continents. 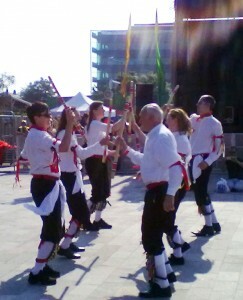 The English Folk Dance and Song Society (EFDSS) was involved in a number of events leading up to the start of the Games and provided advice and information to enable many other events to include folk music and dance. Our events included the presentation of two new dance performances: ‘The Ballroom of Joys and Sorrows’ and ‘Must Come Down’. The former was a new dance, theatre and music show featuring a professional company of performers joined by a large number of community participants. This beautifully funny and poignant show created by choreographer Kate Flatt used traditional music, customs and dance to tell the story about a group of travelling players and featured folk musician Tim Van Eyken. ‘Must Come Down’ was an exuberant staged performance of morris dance and live music performed by Morris OffSpring, a company of young dancers aged between 15 and 25 years, supported by five musicians; the show was staged by Laurel Swift . The Torch Relay that saw the Olympic torch taken to nearly every corner of the British Isles proved a great opportunity for display dance teams to get involved. EFDSS was invited by Camden Council to stage a half hour performance of traditional dance as part of the events to herald the arrival of the Torch in Camden in North London, where the home of EFDSS, Cecil Sharp House, is based. Camden Clog and Sharp Morris were our representatives; both groups rehearse at Cecil Sharp House and have long associations with EFDSS. They flew the flag for English folk dancing brilliantly, performing in front of an enthusiastic crowd and on one of our rare sunny and rain free days! This entry was posted in Features & Fun, Guest Posts, Ideas & Resources on August 14, 2012 by Lynn Nichols. Hello from Timber Ridge! Our first full day at camp greeted us with cool weather. I had a lovely morning chatting and dancing with caller Ralph Sweet. I dropped into Gaye Fifer’s “Young Leader Course” session this morning and I helped Abby Ladin teach “tinikling,” a Filipino folk dance, to the 8-9 year old group. Many campers are sharing their ideas for our Centennial Celebration—lots of good stuff to bring back to the office and the centennial planning task groups! I leave tomorrow morning bright and early before breakfast to drive to the Baltimore airport to fly home. Then off to Pinewoods at the end of the week! 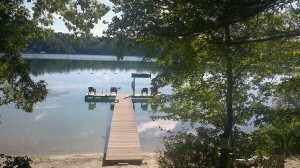 This entry was posted in Camps & Programs, Features & Fun on August 13, 2012 by Lynn Nichols. Hello from the D.C. area! Robin Hayden, Director of Development, and I are here to meet with strategic partners, funders, donors, members, and to dance! On Wednesday night, we had a delightful time at the Glen Echo English country dance in the Town Hall on top of the Post Office. The dance featured recent CDSS board president Bruce Hamilton (Menlo Park, CA), calling to the music of Becky Ross (fiddle), Anna Rain (recorders), and Melissa Running (piano). It was great to see current board member Carol Marsh, and meet many, many new friends, some who I will see again at Timber Ridge on Sunday. Many thanks to Stephanie Smith and Will Strang who are dance coordinators and our hosts on this trip! In D.C. we met with Barry Bergey, Director of Folk and Traditional Arts, and Bill Mansfield, Folk and Traditional Specialist, at the National Endowment for the Arts. It was a good meeting to understand their funding process and what they look for in quality grants. 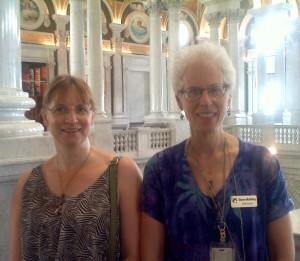 Then we went off to meet CDSS member Sharon McKinley, at the Library of Congress, who graciously toured us around the Jefferson Building. 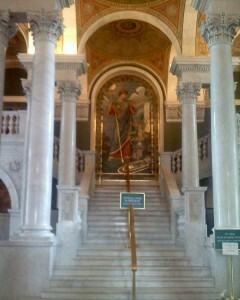 Check out the above photo of the marble mosaic of Minerva by Elihu Vedder. 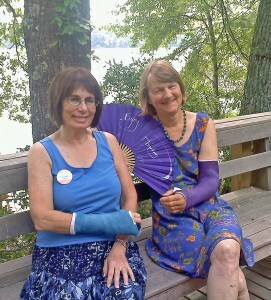 (While marveling at Minerva, I also took the picture of Robin and Sharon, below.) After the breath-taking whirlwind tour (we saw a Guttenberg Bible and amazing tile work! ), we met with Betsy Peterson, Director of the American Folklife Center at the Library of Congress, Jennifer Cutting, Folklife Specialist, and Thea Austen, Public Events Coordinator, to talk about potential collaborative projects for the Centennial. It was an invigorating day filled with lots of brainstorming and strategizing on multiple possibilities. And tomorrow, more meetings and dancing! This entry was posted in Features & Fun on August 13, 2012 by Lynn Nichols. Rima at Camp—part 6: English & American Week at Pinewoods, and more! Berea College, Texas Tech, and the Castaways? My continued travels to each week of CDSS camps had me stopping at English and American Week this past Sunday and Monday (more below), but the Friday before we had another visitor to our office in Easthampton—Deborah Thompson, Director of Programming for the Appalachian Center at Berea College, stopped by our office on her way to Pinewoods. We wore her out from chatting about our programs, education, her newly completed PhD program, shared opportunities, and partnering on projects that would be mutually beneficial. (I realize that sounds all very official, but as you see from our picture, we had a great time connecting!) We are very excited about the possibilities that can come out of future collaborations. At Pinewoods this time I stayed in Twin Sisters. It was a homecoming of sorts, since I stayed in Quite Carried Away, a cabin nearby, with my daughter during Family Week. My daughter asked me to check on how the fairy houses were doing near her cabin, which I did. In case you were wondering, happy to report, they are doing okay. 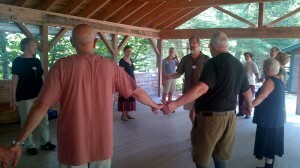 One of the joys of camp is meeting, dancing, singing and playing music with folks from all over. 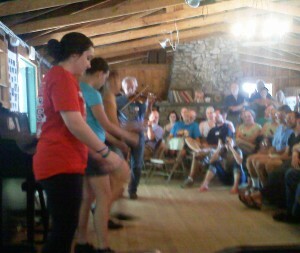 At English and American Week, it was great to connect with the Texas Tech students from the Vernacular Music Scholars Program (http://www.vernacularmusiccenter.org/outreach-scholars.html), pictured here dancing, with Jim Morrison on fiddle. Our partnership with Texas Tech and Vernacular Music Center Director, Dr. Chris Smith, is a great partnership and friendship. There were six students (four returnees and two new) this year, with scholarship support from CDSS. 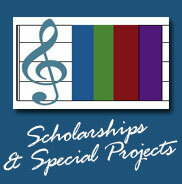 We are happy to continue our work fostering emerging talent and practitioners in our genre. The most amazing part of my summer travels has been meeting many CDSS friends and family—new and first time campers, multiple generations of campers, musicians, dancers, teachers, dance gypsies, historians, scholars…well, you get this picture. My time at English and American Week was along those lines. It is fun for me to put faces to the names of the book authors, songwriters, dance leaders, dance historians, composers, choreographers and artists who are part of our community. It is fun, important fun, for me to listen and learn from those who have come before me and to engage in discussion of what lies ahead for CDSS. I feel that I have been given a very special gift. I accept the responsibility to steward this organization in a manner that respects the history and traditions from where we came but to be forward looking to ensure a sustainable and viable CDSS. I look forward to partnering with everyone I’ve met to celebrate our Centennial in 2015 and beyond. 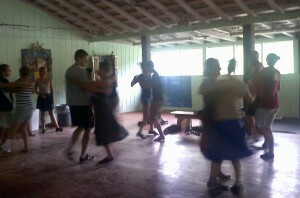 This entry was posted in Features & Fun and tagged cdss, contra dance, english country dance, pinewoods, rima on August 9, 2012 by Lynn Nichols.